If you want a laptop but you’re running low on budget, a Chromebook would be a great choice. There are many in the market, which focus on different roles or qualities, but you want one that would combine them all to be the best Chromebook in 2019. To help you pick and choose the best one for you, upcoming is Chromebooks for 2019 that have been hand-picked depending on budget, battery, flexibility or other. Enjoy! The Asus Chromebook Flip C302CA comes with great features. It has a stylish and compact design, a 16:9 wide-viewing angle, and 1920 x 1080 FHD display. It also has an all metal body, made out of durable aluminum and constructed to withstand anything. There is a unique 360-degree hinge that lets you use the Asus Chromebook Flip C302CA in numerous ways, whether as a laptop, tablet, stand or tent mode. It has a built-in light sensor to automatically adjust the brightness to suit the surrounding environment. The Asus Chromebook Flip C302CA is powered by up to 6th generation Intel Core M3 processor, supports up to 4 GB DRAM. So it turns on instantly and runs apps smoothly. It also has 64 GB storage. It also has two USB-C ports for transferring media up to 5Gbps while keeping complete backward compatibility. Stay connected with the 802.11 ac Wi-Fi with speed 3 times faster than 802.11n. It also has superb Bluetooth 4.0 for even faster connectivity. The battery is designed to last 10 hours on a single charge, which allows you a great deal of time to enjoy. It weighs less than 2.65 lbs. and is 13.7 mm thin, which makes it quite portable. The hinge, touchscreen, and support for Google Apps make the Asus Chromebook Flip C302CA a great choice with the variety of options it has to offer. If you’re going to be working for a while, and need a companion that endures with you, then the Acer Chromebook 14 is the one for you. Its battery life lasts up to 12 hours. Its solid build makes it resilient, and it has a spill-resistant keyboard. Top covers are encased in tough Corning Gorilla glass and chassis that can handle up to 60 KGs of downward force and is shockproof to up to 45 CMs high drops. It has the latest 6th Gen Intel Core i2 processor, which makes it the fastest Chromebook so far. It provides 32 GB of eMMC storage space and 8 GB RAM. Full USB 3.1 Type-C support allows you to transfer data and charge your device faster. MIMO 2×2 802.11 ac3 gives you up to 3 times faster wireless speeds. With a combination of the chassis of 13-inch laptop and 14-inch screens, achieved by the narrow bezel design. Plus full HD2 display, max screen resolution 1920 x 1080 pixels and wide angle viewing, what more can someone ask for! Their top covers can be customized to include your organization’s corporate logo or personalized graphics. You can also enjoy Google Hangouts with the wide angle HD webcams and dual-array electronic microphones, you can enjoy a call with great video quality and clear conversations with no background noise. With dimensions 13 x 8.9 x 0.9 inches and 3.2 pounds heavy, it is easy to carry around. The Acer Chromebook 14 is great for business users who need a durable battery and is MIL-SPEC-tested. It is quite a powerful Chrome OS laptop & the best chromebook 2019 for business. The Acer Chromebook R 13 allows you to choose between four modes: notebook, pad, display, or tent to accommodate any preferences. It works in silence, as it has a fan-less design keeping your device dust-free while it works with no noise. It is just 15.5 mm, which makes it quite thin and easy to take anywhere you go. The Acer Chromebook R 13 has a durable battery life of 12 hours, and it runs on 2×2 MIMO 802.11ac technology which supports up to two data streams in each direction for better wireless performance. With 2.10 GHz MediaTek processor, 13.3-inch screen with 1920 x 1080 resolution, Imagination PowerVR GX6250 graphics coprocessor, a choice of 16, 32 or 64 GB storage and a 4 GB RAM memory, it gives a really great performance and allows you to watch movies, videos, and more with comfort and ease. It comes with dimensions 12.83 x 8.98 x 0.61 inches and weight 3.28 lbs. With the Type-C port that supports ultra-fast data transfers, power, and higher display with a very compact USB 3.1 port. It can also charge your other devices while your Chromebook is turned off. With Wi-Fi and Bluetooth 4.0, you have plenty of connectivity. You can download a variety of apps from the Google Play Store, as well as themes and extensions to optimize the use of your Chromebook. The automatic updates help keep your Chromebook safe with up to date virus protection. It stays synced with your Android phones and tablets, so you have all your files and data with you wherever you go. The Acer Chromebook R 13 is not bad for the battery life and getting you through the day, though the performance isn’t the best out there for the price range. But if you’re looking for the battery life, It’s one of the best chromebooks in 2019 for you. With an all-metal body and all aluminum alloy housing, it has the combination of sustainable build quality and stylish design. It is thin, light, and compact, but it packs a big screen that offers HD and Full HD resolution, IPS display technology which boasts 41% more pixels than an HD display making media like photos, videos, games, and presentation more lively and sharpens the text. Furthermore, a low reflection, anti-glare screen giving you great display and productivity. With a battery life of 12 hours, it will have your back throughout the whole day, so it’s the best Chromebook for elongated battery life. You can enjoy 3 times faster wireless with the dual-band MIMO 802.11ac technology. You can stream, download, and share all the content you want, fast. The built-in webcam supports High Dynamic Range (HDR) imaging, which brings your Google Hangouts to life, with more clarity and intricate details. With dimensions 9.31 x 13.43 x 0.67 inches, and weight 3.42 lbs. 32 GBs of internal storage, and two built-in speakers. Though the full HD display doesn’t work as well as you might want it to, and to work the option you’re going to have to pay more. The keyboard could also use more travel to facilitate typing. The Acer Chromebook 14 offers a great deal of features and qualities you need from a regular laptop and some extras like a metal body and a long battery life of around 12 hours. The Samsung Chromebook Pro comes with a variety of amazing features, starting with its specs: an Intel Core M3 processor with 0.9 GHz speed and RAM size 4 GB. It comes with a built-in stylus pen for easier and more precise clicking, taking a screenshot or magnifying, it will help you whether you’re doodling, sketching, or editing a picture. It has a 12.3 inches LED display, with display resolution 2400 x 1600 pixels. It has a superb Quad HD display made of sustainable Gorilla Glass 3 which looks great from both a close or far distance. With a 3:2 aspect ratio, you’ll enjoy widescreen viewing and portrait tablet experience, so it provides a bright and sharp display, an integrated pen and solid battery life. Though Android apps need yet some work as they slow down the device a little, and are better used one at a time in full-screen mode. However, you can easily run multiple apps at once, so you can multi-task by creating documents while playing a game, or chat while you watch a video. It was built to support Google Play Store, so you can operate your everyday phone or tablet apps but with a laptop experience. This makes it the best Chromebook for multitasking. With a hinge to rotate the screen 360 degrees, you can change the mode from notebook, pad, display, or tent. You can download your files and data so you can use it where you can’t reach Wi-Fi connection. It comes with dimensions 8.72 x 11.06 x 0.55 inches and weighs 2.38 lbs., but with its lightweight, it packs power with its Intel Core to run 3D games, video editing programs, and other advanced software. Its sleek metal body makes it easy to carry as a tablet and to fit in your bag, all while keeping the features of a Chromebook intact, where it has a full-size keyboard –which is spill resistant- and trackpad. The Samsung Chromebook Pro comes with a year’s warranty. Despite the being almost too similar in characteristics to an Android tablet, the mixture is a great combination between Chrome OS and Android. The Samsung Chromebook 3 was built for durability, it can be used by the whole family. Its spill-resistant keyboard makes its use by kids safer. The patterned outer case ensures a secure grip, while the sturdy chassis frame protects it from drops and bumps. It was also designed for portability, it offers everything from surfing the web, streaming media, and working on documents in a compact design with dimensions 8.04 x 11.37 x 0.7 inches and weight 2.54 lbs. It has 32 GB of internal storage and runs on 4 GB RAM. Its battery has a life of 11 hours, so you can take it out all day with a single charge. It is strengthened with Battery Life Extender technology which retains only 20% of the initial capacity after over 3 years of use! The 11.6 inches screen is provided with image-enhancing technology that gives you the best quality, with resolution up to 1366 x 768 pixels, mix that with reclining the screen up to 180 degrees, and you can watch movies or series with absolute comfort. The only downside is that the speakers are quite weak and the placement of the keys is bizarre. The software runs on Intel Celeron processor with 1.60 GHz speed and is made for extended connectivity, where it is compatible with Android devices with AirDroid connectivity to see notifications, texts, calls, and messages from other Android devices. The few downsides of the Samsung Chromebook 3 are compensated for by the amazing battery life and strong build of the device. It’s a great low-budget choice and the best chromebook for the money. The Google Pixelbook can be used in four modes, as a laptop, tablet, display, or standing up. It has an aluminum unibody with Corning Gorilla Glass detail. It is 10.3 mm thin, with 360 degrees hinges to support the different modes. Its battery lasts up to 10 hours and gives you up to 2 hours of use in 15 minutes of charging. The keys are soft and quiet, and the keyboard is backlit to glow in dim lighting and an edge-to-edge trackpad. It’s built for speed with the strong 7th generation Intel Core processor, so you can browse faster, multi-task, and entertain yourself. Mixed with an astounding 8 GB size RAM, you get amazing performance. It has 3-axis gyroscope/ accelerometer and ambient light sensor to adjust brightness according to the surrounding environment. It has a 12.3 inches screen with 2400 x 1600 pixels resolution and Quad HD touch-enabled IPS display, which provides 235 pixels per inch resolution. The pen designed for Pixelbook works with Google assistant, doesn’t lag, has tilt support and is pressure sensitive. It has voice commands to facilitate your operation. You can use it, press assistant key, or circle with Google Pixelbook pen to get help from Google Assistant to get help whenever you need it. Its size is 11.4 x 8.7 x 0.4 inches and it weighs 2.4 pounds. The Google Pixelbook is easy to use, always up to date with the latest security updates and features, as it updates automatically. The Google Pixelbook can actually be compared to high-end Windows and Mac devices, it has an excellent design and gigantic software enhancements, all at a very low price, making it an optimum choice and maybe the best Chromebook for 2019. 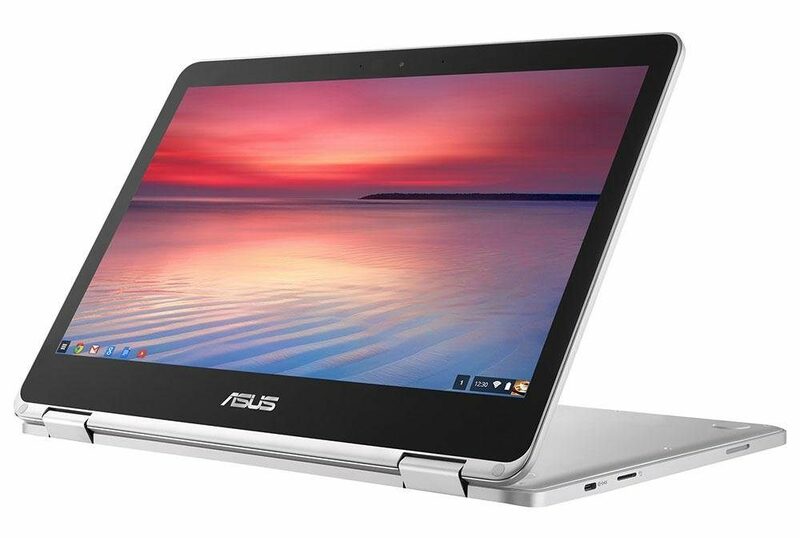 Asus Chromebook Flip C302CA – We consider it as the best Chromebook you can buy in 2019. After you’ve set your budget, there are a few things you should put into consideration when you’re trying to decide on which Chromebook you need. These are listed below to optimize your decision-making process. Storage: An average phone has at least 16 GB of storage, so you might want your Chromebook to be the same or preferably higher storage space. 32 GB to 64 GB of hard-drive storage would be more than enough. Screen: The average Chromebook screen is around 14 inches with HD or full HD resolutions. Battery life: The average Chromebook’s battery lasts around 10 hours, so when trying to choose one, you might want to estimate the number of hours you will put it into use. Performance: Processor models and processing speeds are an indicator of how well your Chromebook will perform. The newer the generation of the core, the better performance it will give you because of higher gigahertz speed. You might also want to check the size of the RAM memory as it helps with the lagging; the higher the size, the smoother the performance.